It’s apple season, and boy, we have a lot of them. My daughter had a field trip apple picking and I was a chaperone. Now we have 2 bags of apples and I’ve been trying to come up with some recipes to use some of them up. 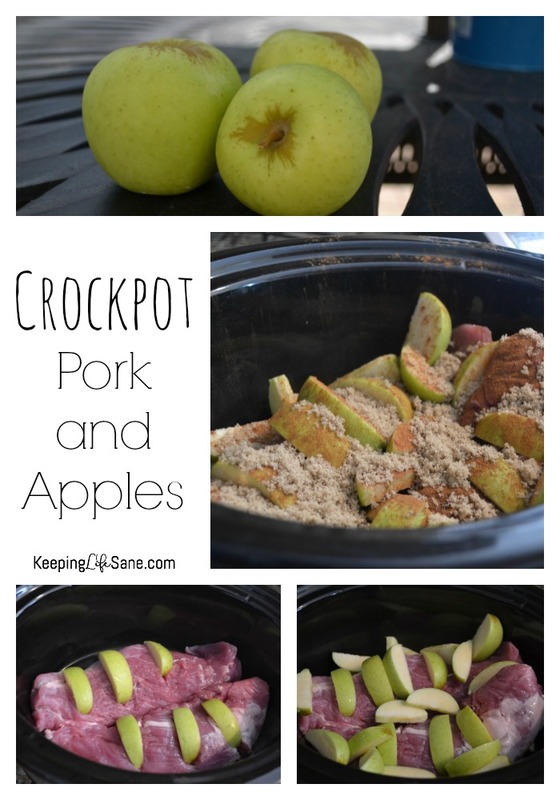 I made this crockpot pork and apples and it was a hit! I’m always using my slow cooker. Here’s a link to the #1 best seller at Amazon. It’s really inexpensive, if you need a new one. I just bought a new one because my other one went kaput. The black bowl had a huge crack down the bottom and was leaking liquid all over the place. It felt so good to open the box and see that nice clean bowl! Isn’t it funny how the little things make us happy! Anyway…I’ve been trying to use my crockpot more since school started. I have kids in soccer, lacrosse, football, and baseball. We also have faith formation and guitar lessons in there too! I barely have enough time to cook. Sometimes I start dinner when the kids leave for school because that’s the only time I have to cook anything. When we get home at night, we just heat it back up. 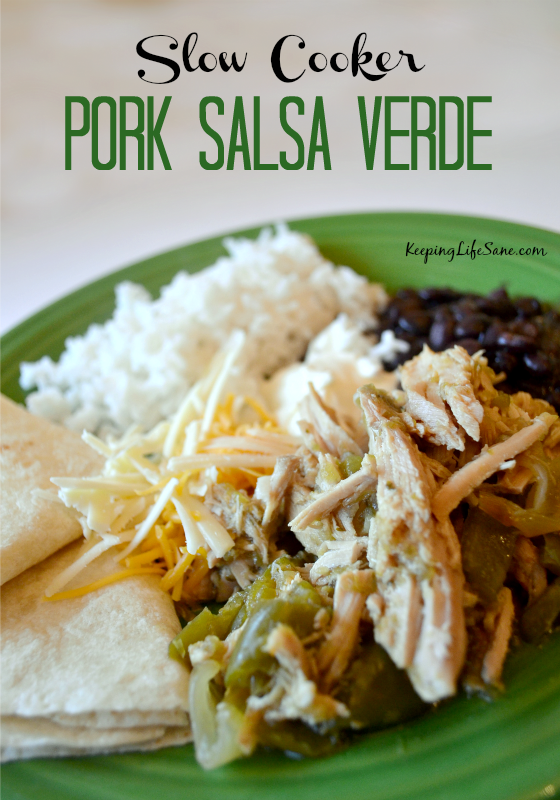 Slow cooker meals van be hit or miss with my kids. This is one they LOVE! They tend to think beef is dry so I’ve been sticking with pork and chicken. 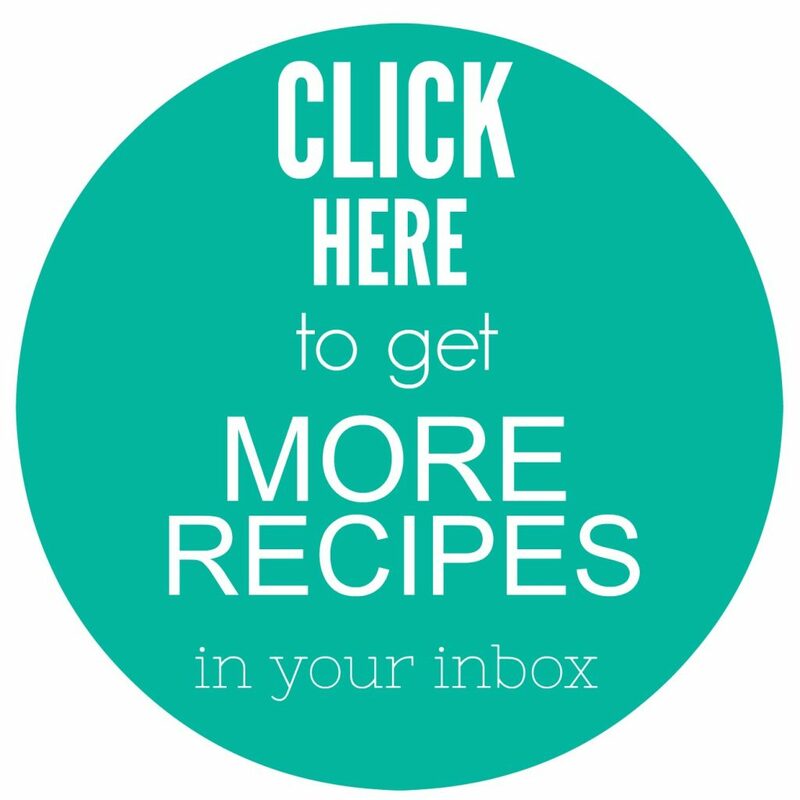 Hopefully I can get some time to throw some new recipes up here and share them with you. Lay the pork loin in the bottom of your slow cooker. 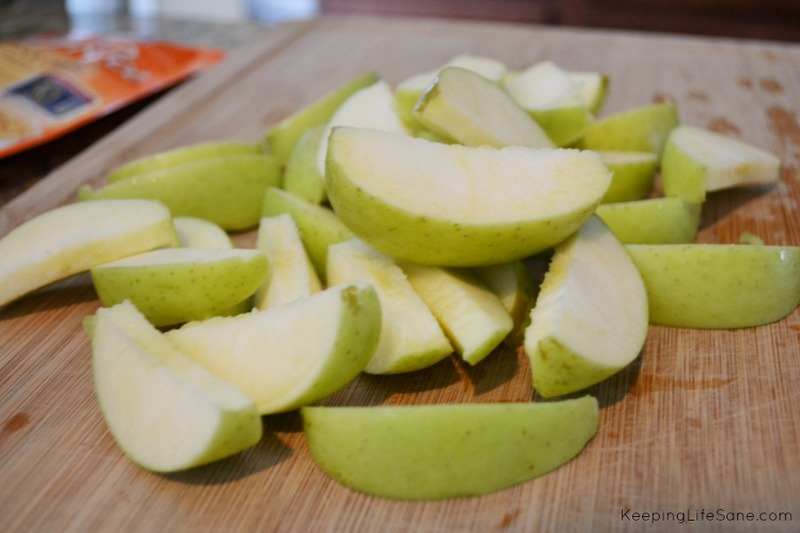 Slice up the apples and lay them across the top. 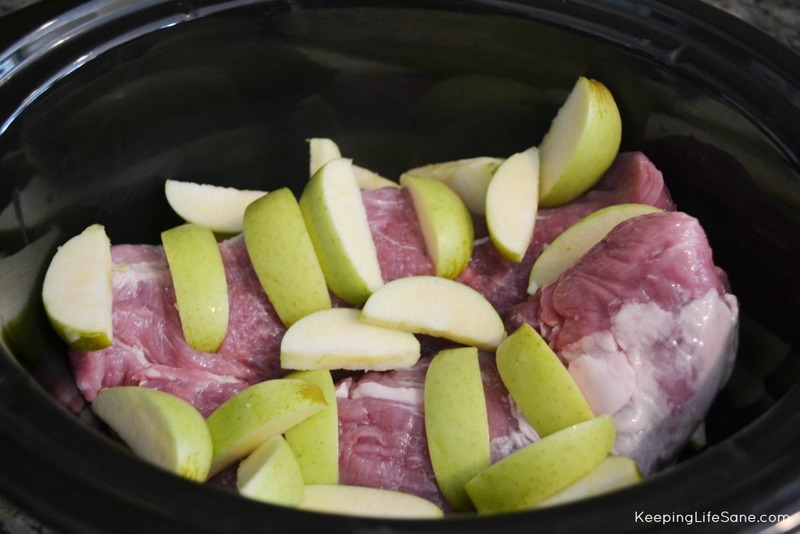 You can put slits in your pork and slide your apples slices (if you have time). 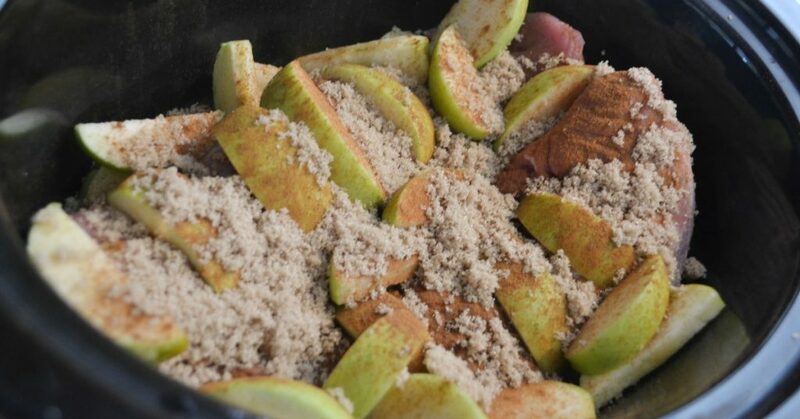 Then I sprinkled the cinnamon and brown sugar on top. That’s it! I cook on low for about 6 hours. Doesn’t it look delicious? Pair it with sweet potato fries or a baked sweet potato for a great fall meal. What other sides would you suggest? We aren’t sweet potato fans. Thanks! What about butternut squash? Kale? If neither of those, I would just do green beans and mashed potatoes. Most people like those.